Surfin' USA . . . ."
And if you don't recognize that tune, you clicked here by mistake! Everybody except the parents, that is. 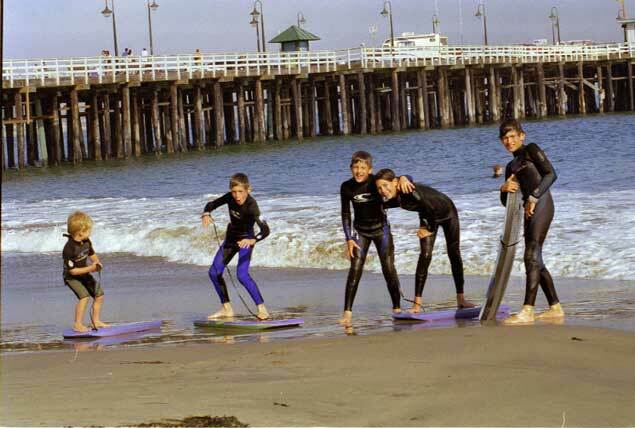 And actually, in September 1999 when these photos were taken, the children (except Alex) were all boogie-boarding. Santa Cruz Wharf is behind them. Nick demonstrates below what they were doing. As do Daphné and Tom, sharing a wave that same afternoon, again on the right. Boogie-boarding is a lot of fun! 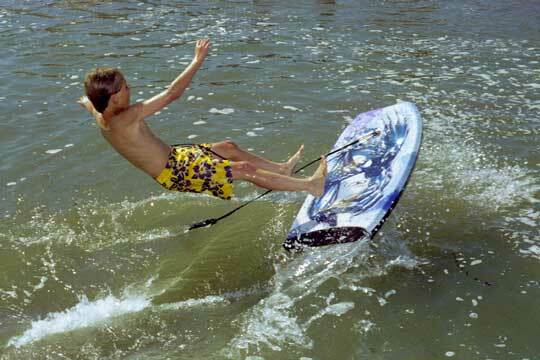 Surfing came later, starting seriously in the summer of 2000.  But it is not a constant preoccupation. In 2004, we still had two surfboards at home, but except for Nick (and he went on and off) they did not and don't see that much activity. Alban focused on mountain bikes and the "15 foot drops" and "jumps" that can be done with them. We try not to look. 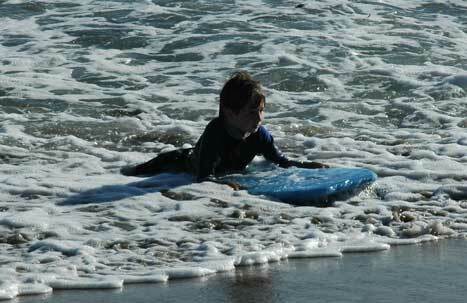 After Nick moved out in the summer of 2005, surfing seemed almost to stop. He tried to keep it up, but working as a programmer and taking a full course load did not leave him a lot of time. 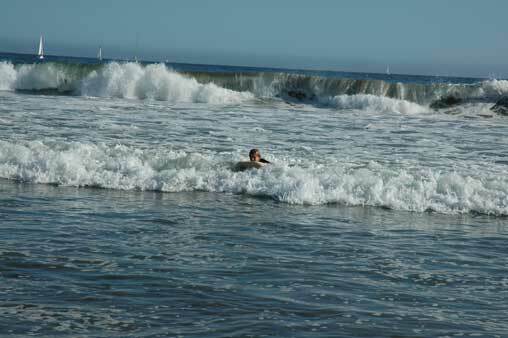 Surfing is also impossible to photograph from the shore with amateur equipment. Watching Nick a couple of times with camera in hand, we could not tell whether or not he was the subject in the viewfinder! The best surfing typically occurs a way off-shore. Here is an exception. 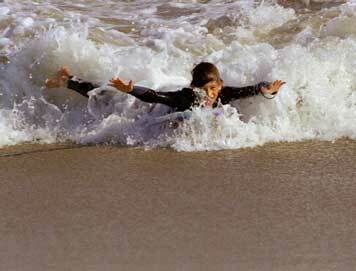 But boogie-boarding has stood the test of time, and has given us some great photographs of our children having fun. Here is Charlie on the left doing some wild boogey-boarding in May 2004: he had jumped off the sand on to the board floating in the creek, and is falling off backwards in the picture as the board flies forward. This is the creek that cuts through Capitola beach some years. 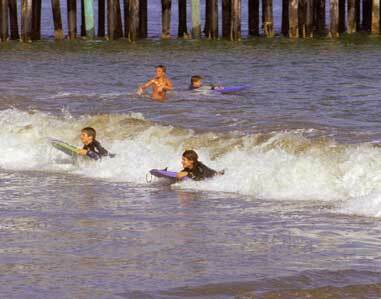 And here is Alex on the right mastering the boogie-board at Twin Lakes Beach in May 2004. Here is more water, in the form of swimming pools, more swimming pools, river rafting in Colorado, a great British water ride and the log ride at the Boardwalk. More boogie-boarding . . .
Tom in a big wave on a boogey-board at Twin Lakes Beach, May 2004. He's in there all right, just getting a little bounced around! 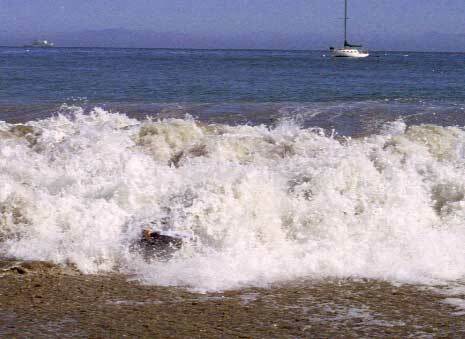 Charlie coming in on an almost as big wave at Twin Lakes Beach, May 2004.